As data breaches are becoming more prevalent, and more organizations are becoming targets for malicious attacks, the stakes are especially high for the healthcare industry. Join this presentation to learn about the current cybersecurity threats and the tactics for defense organizations need to deploy for early detection and incident response. 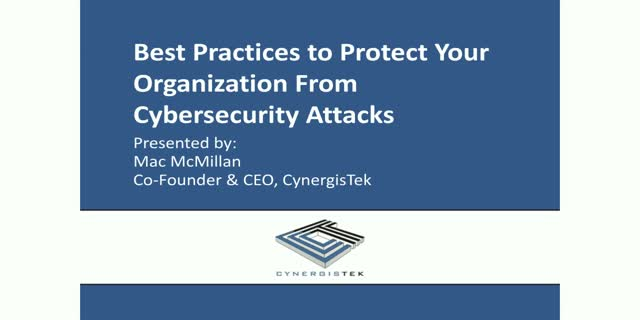 Mac McMillan, CEO and co-founder of CynergisTek will illustrate what an attack looks like, the phases of the hack, and how to use technology as well as policy to aid in detection, and then how to construct a disciplined incident response process. Lastly, learn how all of this should be integrated into a comprehensive information security strategy. Modern Healthcare IT infrastructures are a complex blend of technologies, from mission-critical Electronic Health Record (EHR) applications to the security solutions protecting patient data from ransomware and other threats. Overseeing an entire healthcare system's networks and infrastructure, as well as managing patient data in a private cloud, can be time consuming, costly and pose potential cybersecurity threats and data breaches. That’s why fast, reliable IT is crucial to every step of the patient’s journey through your organization—and why you need a new approach to IT operations and monitoring. Learn where your visibility gaps lie, and how closing those gaps with real-time performance monitoring will dramatically improve the quality of care and IT security that your organization provides. Hear first hand from one of the nation’s leading healthcare providers, Intermountain Healthcare, on what is actually being accomplished with big data and machine learning (cognitive computing, artificial intelligence, deep learning, etc.) by leading healthcare providers. Intermountain has evaluated between 300 and 400 big data and analytic solutions and actively collaborates with the other leading healthcare providers in the United States to implement the solutions that are delivering improved healthcare outcomes and cost reductions. With over 90% of all new and upgraded Epic deployments using flash, your best chance at a successful deployment is to learn from other Epic customers who have already deployed on Flash. So if you are a current Epic Provider or looking to implement Epic, this is a great webinar to hear real world feedback from Epic customers about how to build a fast, resilient and secure Epic infrastructure using Flash storage. With all the advancements of technology in health IT, it's important to stay on top of all the increasing demands of your IT operations. Join us for a panel discussion with Epic customers about the results they have seen from using Flash to run their Epic environments. Hear the differences you should expect when designing and sizing Flash for Epic. They will share the benefits and issues. Healthcare privacy and data protection regulations are among the most stringent of any industry. Join this Webcast to learn how healthcare organizations can securely share health data across different cloud services. Hear experts explore how Encrypted Objects and Delegated Access Control Extensions to the Cloud Data Management Interface (CDMI) standard permits objects to freely and securely move between clouds and clients with enhanced security and auditability. Richard Izzo, Biomedical Engineer at The Jacobs Institute, Inc.
3D Printing is a compelling new technology which is revolutionising cardiac interventions, in many areas,including especially, congenital heart disease, and surgical planning for valve replacements, customised to each individual patient. Some say actual 3D Printed Heart is on the horizon! Pharmaceutical companies play an ever increasing role in the treatment and prevention of illnesses. Many leading Pharma companies depend on third-party organizations, like the Almac Group, to help conduct testing, research and trials to improve the overall drug development process. Almac is a global leader in contract pharmaceutical development and manufacturing services, and recently deployed scriptless test automation to improve its core business application testing in support of its overall business agility goals. This session will focus on how Almac and TurnKey Solutions partnered to successfully shorten test cycles and improve test outcomes - supporting more rapid deployment cycles for core applications and end-to-end business critical processes. What is HIPAA? What information is protected by HIPAA? Do we have to sign Business Associate Agreements with our vendors? All of these questions and more answered on this BrightTALK exclusive webinar, 8 HIPAA FAQs for Businesses. Join Carlo Tapia, Product Marketing Manager at eFolder, as he takes you through commonly asked questions, an overview of HIPAA, the costs associated with HIPAA violations, and how to protect sensitive patient health information. Business influencers and IT admins will appreciate this 45-minute introduction to the stringent regulations of HIPAA. Technology can do amazing and complex things, especially in this day and age. But, sometimes modern technology can be applied to solve simple, relatable everyday challenges with fantastic results. Listen in to learn how today's cutting edge IoT & wearables technology can be deployed to drive significant business results including vast improvements in customer service, patient health care, and more. The opportunity is upon us to revolutionize service ethics across many industries in ways unavailable to us before IoT & wearables converged in these simple ways. Recent research reveals that care providers are using mobile technologies to enhance care coordination and improve patient satisfaction. Are you and your IT team equipped to support mHealth easily and affordably? Deploying new patient record systems is more than just servers, networking, and storage. Specialized software applications, compliance and secure data management all need to be considered. Traditional technology vendors all offer partial solutions but you’re left with the hard work. Join Chris Bukowski, Product Manager from NexGen Storage to learn about a better way to deploy patient record systems that include new value-driven data management capabilities that ensure a superior end user experience. Based on recent research by analyst Bob Larrivee of AIIM, this webinar will address how organizations can leverage technology to identify, evaluate and optimize business processes to increase operational efficiency. Global health crises are making headlines daily and the medical industry’s ability to respond effectively depends on rapid access to data storage for archival and analysis. Data management has always been a healthcare challenge; today’s data stores are growing exponentially, and the requirement for responsiveness is accelerating. Join this presentation to hear from industry expert Skip Snow of Forrester Research on the big trends in healthcare data management and Eric Rife, subject matter expert from Nexenta on the compelling Software Defined Storage solutions to meet these requirements. VM Racks CEO Gil Vidals will continue the conversation by showcasing how SDS helps meet HIPAA compliance and healthcare’s unique requirements. If your healthcare company does not have a disaster recovery plan in place, you are putting your business, customers and data at risk. Fire, flooding, hurricanes, power failure, theft, cyber attacks and more can all have devastating effects. If your company cannot afford the downtime, loss of revenue and productivity associated with a disaster, be it natural or manmade, now is the time to form a disaster recovery/business continuity plan that leverages a data center provider to maintain your IT operations. Join OnRamp’s Founder Chad Kissinger for this 45-minute presentation and Q&A on disaster recovery, and learn how to create a plan for 100% uptime. The healthcare industry presents its own unique technology challenges ranging from infrastructure and storage to security and compliance. Join this BrightTALK Channel to view a variety of webinars from analysts, associations, end-users and vendors describing the latest IT trends and best practices.